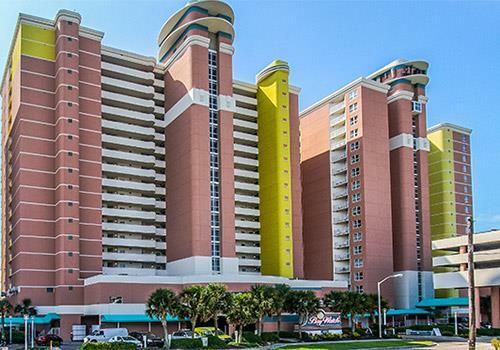 An iconic high-rise resort in North Myrtle Beach, Bay Watch Resort and Conference Center offers vacation condos that offer large oceanfront windows, private balconies, and more. 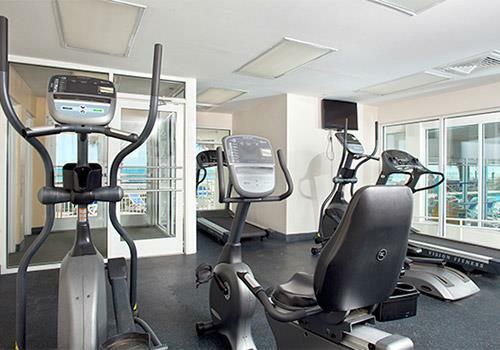 Guests can enjoy spacious one-, two- and three-bedroom suites, as well as an on-site fitness center, on-site dining options, a video game room, three oceanfront pools and two indoor pools, a lazy river, and more. Three on-site restaurants and bars. Microwave, fridge and flat screen TVs in-room. 2.3 miles from Barefoot Landing. 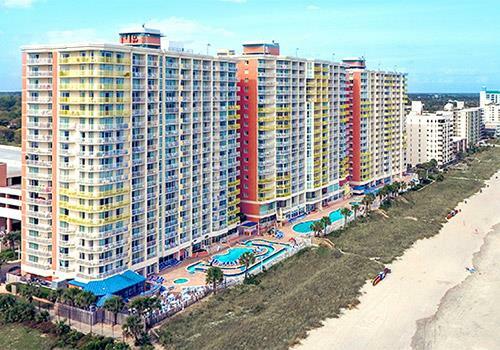 16.8 miles from Myrtle Beach International Airport. 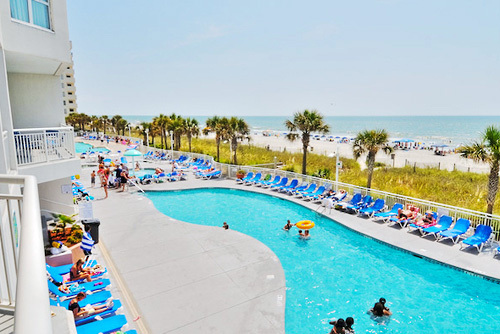 Situated oceanfront in North Myrtle Beach with over 600 feet of white sandy beach, Bay Watch Resort is the perfect vacation destination for families and golfers. 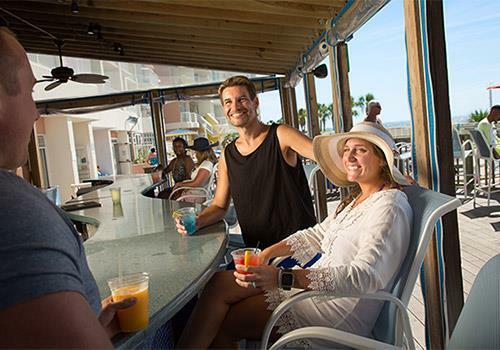 Float along in the lazy river, enjoy your favorite beverage on the oceanfront pool deck, then indulge in a delicious dinner in the oceanfront restaurant. Our oceanfront resort features 270 rooms and suites, ranging from studios to spacious three-bedroom suites complete with a full kitchen and sleeper sofa. 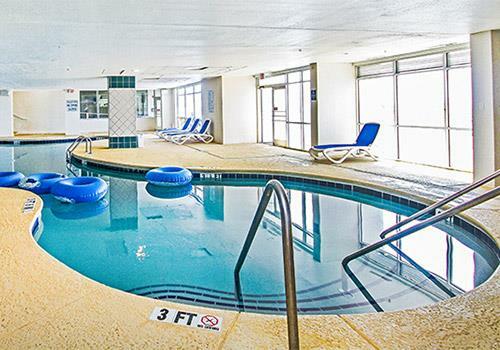 Take in the view from your private balcony or take a dip in one of our 18 indoor and outdoor water amenities. 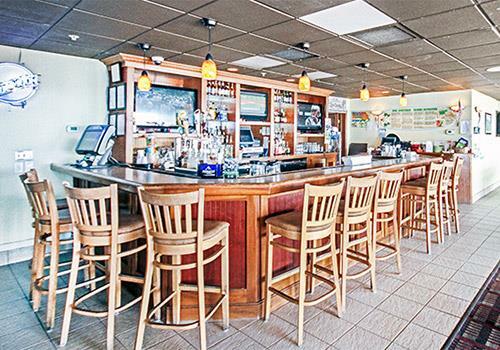 Enjoy a meal at The Blue Room Café, catch the game in Sandtrap Sports Bar & Grill, or grab a cocktail at Fishtails Beach Bar. 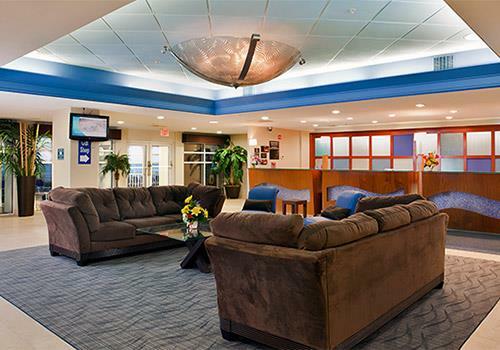 Business travelers will appreciate our business center, as well as Wireless Internet in every room and over 6,500 square feet of meeting space. 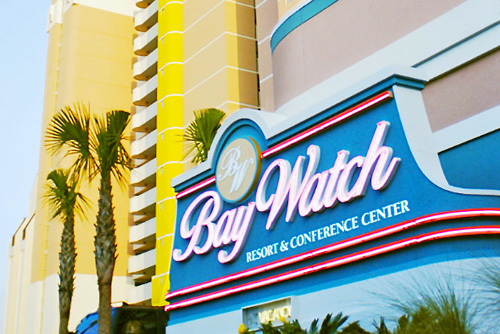 When searching for hotels in Myrtle Beach, Bay Watch Resort & Conference Center is the top choice. Pet fee of $21.60 charged nightly and paid upon check-in. How many rooms are available at Bay Watch Resort? 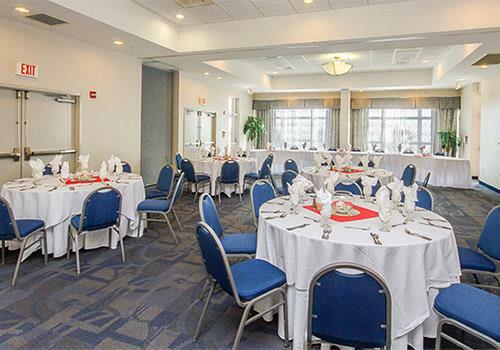 There are 270 rooms are available throughout at total of 19 floors. Yes, the Blue Room Café serves breakfast daily and dinner on Friday and Saturday. The Sandtrap Bar and grill serves light fare and cocktails and seasonally guests can also grab a drink or snack at Fishtails Beach Bar. A gift shop/sundry shop is also located on-site. 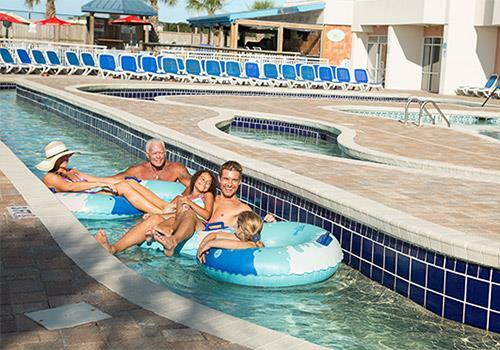 What is the minimum age required for check-in at Bay Watch Resort? 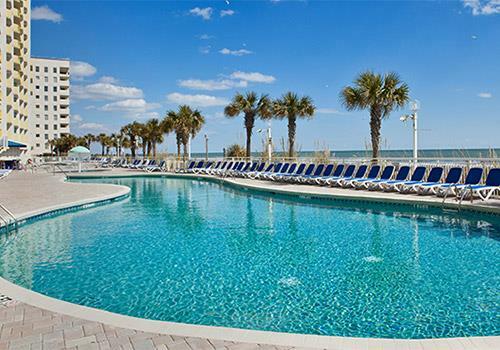 Bay Watch Resort has a $5.00 Resort Fee, charged nightly for length of stay. 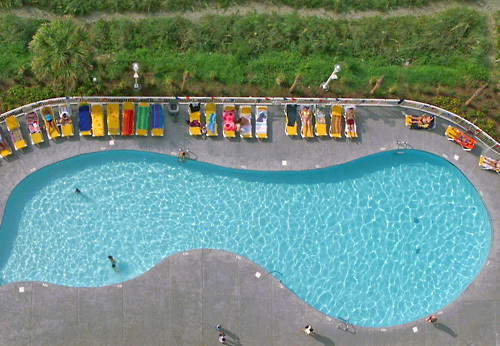 Is there a charge for rollaways or cribs at Bay Watch Resort? 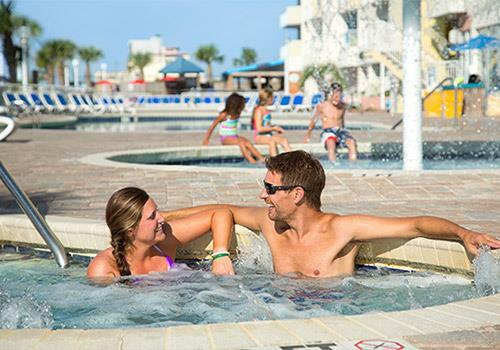 What are the pool hours at Bay Watch Resort? How far is Bay Watch Resort from the Myrtle Beach Airport? Yes, Bay Watch Resort is a smoke-free property.